One of the most common questions over on the Wise Bread forums is some variation on, "I have $X in savings but $Y in credit card debt. Should I use the savings to pay down the debt?" The answer, of course, depends on your situation--and there's a reason why the question keeps showing up. Here's how to do the analysis. The first step toward answering this question is to ask another: do you have an emergency fund? That's because figuring out the cheapest thing to do is easy--just compare interest rates. If your savings are earning you less than the cost of your debt, then you'll save money by paying off the debt. But that's only the right choice if you have an adequate emergency fund. Of course "adequate" is a tricky question for emergency funds. I've written a whole article on figuring the size of your emergency fund that breaks down the reasoning behind the rule of thumb that you want at least 3 and preferably 6 months spending in your emergency fund. For people with debt, though, the calculation changes. You still need at least a minimal emergency fund, simply to manage little glitches in cash flow (such as a payroll or banking hiccup that delays your direct deposit over a holiday weekend). But once you go beyond that minimum--maybe $1000, maybe one month's take-home pay--any extra emergency fund cash is probably costing you bunches in interest on your debt while earning almost nothing. A lot of people seem to think that having extra debt means they need to have extra in their emergency fund--so that they have cash to cover their debt payments during a period of unemployment. Sadly, I can't say that's definitely wrong: If you can't cover your minimum payments and start racking up late fees, those charges will totally swamp any interest payment savings. The analysis has to come down to your best guess on what the future might look like. My take is that getting the debt paid off sooner rather than later improves your situation so much that it's worth taking a small risk. After all, even a large emergency fund will go pretty quickly if it has to cover large debt service payments. Establish a small emergency fund--something like $1000 or 1 month's pay--to cover the ordinary cash-flow mismatches that always show up between income and outgo. Once that's done, aggressively pay down any debt (with the possible exception of long-term debt where the interest rate is both low and fixed, such as some mortgage and student loans). Once you're debt-free, bring your emergency fund up to the 3 to 6 months standard. As I said, there's a reason the question shows up over and over again: There's no way to know the right answer. The more aggressively you pay down your debt, the cheaper it will be--unless you run your cash down so low that an interruption in your income means that you're unable to cover your debt service expenses. Since you can't know the future, any choice that you make will have to be based on your best sense of what the future may bring. Many times it "seems" like it would be smart to use that savings to wipe out the debt, however, if you did and then an emergency came up you are right back to where you started...using credit cards. If you currently have zero in a cash reserve then shoot for that $1,000, otherwise I think 1 months worth is comfortable until you get that debt paid off. I agree with your steps above. Getting that debt paid off will also help reduce the amount needed for an adequate cash reserve as well. Let's reexamine this. This will be a little long, because I don't have time to edit, but it shows a way to account for the relative costs and probabilities, that are relevant to the decision of deciding how much cash to keep on hand. 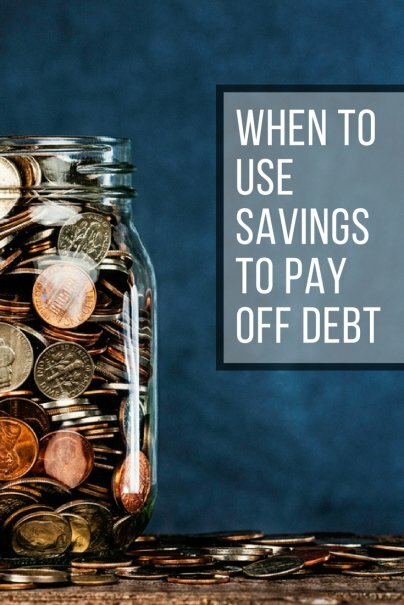 First, realize that there is a 100% chance that if you pay off debt with savings, you will save the money that would otherwise be incurring interest charges. There is a chance that is much less than 100% chance that sometime in the future you might run into a glitch and need to use a credit card to get yourself through it, thus costing you interest charges. Now compare the current interest rate that you are incurring for your debts. Say it is, like in my case, 5.9%. Figure out the cost for each strategy for the upcoming year. Keeping the extra emergency money aside, and just paying off the balance according to plan month by month, iamgine you have a current balance of $5000 in debt at 5.9% and you pay $300 per month towards it, which means that, leaving aside interest, at the end of 12 months you will have paid $3600,which along with monthly interests charges leaves you with a balance of $1604.00, with a total interest cost over the 12 months of $211.47. Now if you take $5000 in savings and pay off all or a bulk of this amount, thus leaving you with, say, just $1000 in cash cushion, your cost will be the interest you forego on the cash amount, less the interest you would have paid on the debt. Let's say you're earning 2% on your cash. that means that you would have earned $94.63 in interest over the 12 months on the 5000 bucks. Subtact 211.47 from 94.63 and you will see that there is a difference of $116.84 in your favor, cost-wise, to taking 5000 and paying off your debt. But it gets more complicated. You also have to figure out the cost of running out of cash and having to re-use your credit card. If your credit card has a higher rate for purchases than your sweet 5.9% deal that I have assumed, say $15% for purchases, then multiply the risk of having to do that (say, 20% probablility--probably high but this is an estimate) and you need to reborrow the whole $5000 bucks, then you have a 20% chance of incurring a $900 interest rate bill (assuming you'll be able to continue to make $300 per month payments on your debt when you re-borrow. A 20 percent chance of a $900 bill amounts to risk cost in dollars of $180. subtract that from the 116 and you have a total risk cost for this strategy of 64 dollars, which is way ahead of the interest cost of keeping the debt on the back burner, which would cost a total of 211 dollars over the year. Taking the extra money and paying off your debt pays off to the tune of 211-64 dollars or 146 dollars, in other words. Now you have to decide if the peace of mind of having 6000 dollars of cash around is worth the $146 premium compared to having only $1000 in cash around. For me, I'd decide to keep the cash around as $146 is a reasonable cost for having the added fungibility of cash in my life. I know from my own experience that I just am more relaxed about life when I can lay my hands on actual cash (for example, for a used car tire purchase, or buying something secondhand, situations where cash is really king). If the interest rate you are paying on your debt is higher than 5.9%, then the value of keeping extra cash on hand goes down (extra cash costs more). If the interest rate your are paying is lower than 5.9%, the value of keeping extra cash around goes up (extra cash costs more). Yes, exactly. Since "one month's expenses" is the key factor in the size of your emergency fund (it's what you multiply by 3 or 6), reducing your monthy expenses--such as by paying off a loan so that you have one fewer monthly minimum payments to make--can substantially reduce the size of emergency fund you need. What are your thoughts on paying off student loans? How much should I have in savings before even contemplating such an action? There's a special issue with students loans: that they can't be discharged in bankruptcy. So, if your financial life comes completely apart, even a modest-sized student loan can make it almost impossible to start over. On the other hand, if the rate is low and your job is secure and you're comfortably covering the payments--then student loans can work just like they're supposed to: You just act is if the payment were an expense and ignore the balance. That's what I did with my student loan (although it was very small compared with student loans these days)--I made $30-a-month payments for about 10 years to pay it off. But the interest rate was quite modest--higher than what I could earn on savings, but lower than what I could probably earn on investments. I follow Dave Ramsey's debt snowball plan and he says to start paying off all debts (other than home mortgage) once you have $1000 in savings. Make minimum payments on all debts, adding any extra money to the smallest debt. I had been paying $180 a month on student loans and they were scheduled to be paid off in October 2012. Starting this past January, I began paying $900 a month and they should be paid off by the end of 2009. Once they're done, I'll add the $900 to my existing $261 car payment and it will be paid off sometime in 2010. Whatever you decide to do, best of luck! Thank you, Phillip, for outlining this so beautifully. Some of us just need a little more concrete guideline than a lot of financial blogs offer, and this is perfect. Clear goals and steps to take, but the flexibility to fine-tune it to our needs. In a financial emergency, if you only have $1000 in your emergency fund, then you pay the rent, food and basics and let the credit payments (unless you will lose you car) slide. The idea that if you are out of work and down to $1000 and you will keep paying on your credit cards is the stupidest thing I have ever heard. You could be homeless at the beginning of the following month! For Pete's sake. Establish a month's living expenses as emergency fun and then split debt repayment equally between your emergency fund and unsecured debt repayment. If you can pull that off, you will build your reserve and also pay down your debt prudently rather than foolishly. Your employer screws up the payroll and your paycheck is a couple days late. Your landlord decides to rent your place to his brother-in-law and doesn't renew your lease. You make a mistake in your check register (adding when you should have subtracted), and discover that you need $150 today to avoid bouncing a check. You get a better job, but payroll cycles mean that during the transition month you're short one week's pay. In many cases cases you aren't actually out any money--your paycheck eventually arrives, you get your damage deposit back after a month or two--and you can restore your emergency fund. The point is that having some cash saves you money--no bounced check fees, no need for a cash advance or payday loan. With that in mind, I think it's worth aggressively paying off your debt. Yes, if you lose your job before your debt is paid off you're in trouble--but you're in trouble anyway if you lose your job while you're in debt, even if you've got a few hundred (or few thousand) more dollars in your emergency fund. @Phil and Timothy: Thanks for the advice on the student loan. I think I will call my lender to find out exactly when I can pay the loan off at the current rate and how much it would change if I raised my monthly payment by a couple hundred dollars. Make minimum payments on credit cards until you have three months saved up. $1000 is a good start, and yes it will cover the payroll glitches listed, but a medium sized car repair is close to $1000 these days, so you'll need more, otherwise you'll whip out the plastic yet again. You'll have to sell off what ever you have to raise the money, plus make substantial cuts in living expenses--no way around that if you're serious. Prove that you can live beneath your means, that you can live without debt, then you're ready to start paying off the credit cards. Debt is a lifestyle, an emotional "bond", and you have to break that link before you can get out. I could not agree more with this article. My wife and I had this debate recently. We had nearly enough in the bank to completely eliminate our credit card debt but that would also wipe out our savings. We decided to pay off the majority of the debt and leave about $1750 in the bank for emergency situations. The amount left on our card will only take a few months now to pay off out of my salary compared to the years the previous debt would have taken. We considered completely paying off the debt, but decided we needed to maintain some cash reserves. It's comforting to hear that someone else agrees! How does getting laid off in the middle of all of this effect your plan? I have little in true savings, even more in debt and was recently laid off. I'm still looking for work and am not sure what to do. Thanks! A few comments back, I linked to two posts I wrote on emergency belt tightening and dealing with losing a job. They've got the best advice I know to give. @Philip- we had the combination of having a low (circa $1500)emergency fund while paying off debt and then having a serious loss of income (husband got laid off) happen to us at the beginning of this year. And it was awful having that little, despite the fact that my husband ended up getting another job a few months later. In my opinion, $1000/1 months expenses is simply too low for anyone in this unstable economy, whether they have debt or not. I would have felt a lot better with twice the amount that we had- in our case, even having just a thousand extra would have made a *world* of difference both financially and to our anxiety levels. And now that my husband has a job again, we're planning to get almost halfway to our eventually emergency fund goal before stopping to aggressively pay down debt. Yes, it's costing us more money in interest rates, but the way I see it we're buying peace of mind. Can't put a price on that. Yes, not only your own sense of what the future might bring, but also your life experiences up to that point have to feed into your decision. The cost, of course, is not just money (in extra interest you have to pay), but also time: The window of vulnerability is longer. But, with extra cash on hand, it's not open as wide. There simply isn't one right answer for everyone. That's why the question shows up over and over again. Whether to pay off debt should not be that hard of a decision, if one is living and spending consistently month after month. The big X factor is your income situation. If your job is solid and safe and you have the savings to pay off all of a piece of debt you owe (ie a car or boat, or even a home) then that is an easy choice. Pay the debt off and start the debt snowball to take care of other debt or to save so you may pay cash for the next car etc. If your job is not secure then you might want to hold on to the savings. In the mean time, I would cut back on any expenses (if you can) and try to earn even more income (home business, 2nd job) than you are now. This might may life rough for a while, but this should be a temporary thing till the debt is paid for. Being consistent is also key. Putting your budget on an allowance system and spending the same amount month after month will put normalcy in your finances and keep you stable, and then that question will not be as hard to answer because your future will be very predictable as far as spending is concerned. After all, the unknown is what makes this question so tough. A family's budget on an allowance system where money spent is virtually the same each month, makes things a lot easier. These are some great tips on when to pay off debt and how to go about the process step by step. I agree with you that having an emergency fund is absolutely vital before beginning to aggressively pay of the debt. Correction: the interest charges for 12 months on a 5000 dollar balance at 15%, with a monthly payment of $300, amounts to $541, not the 900-some-odd dollars I gave before. Which means that paying off the card with the extra money just got a lot more appealing. You could extend it by estimating costs and probabilites for some of the scarier scenarios. What's the probability that you might lose your job and quickly run through your small savings? In particular, you can't just assume that credit that you've repaid will be available to be drawn down again. Many credit card companies cut their customer's available credit during the recent financial panic--in some cases the cutting credit limit repeatedly, tracking the customer's balance down with each payment. What's the cost if you unexpectedly need $1500 for a new transmission, but you only have $50 in available credit on your card? That's not to say that you shouldn't pay down the credit card, just that if you're going to do a formal analysis, you ought to cover the less common scenarios as well. I have a mortgage right now with mortgage company, amount is 105,308.09, payments are 659.82, right now there is a escrow of about 200.00. 52.33 is added to 607.49 till escrow is paid off. right now 50.00 of the 659.82 goes to the mortgage itself, the rest is interest. I would like to have more go towards the mortgage to bring it down faster. I have asked them about lowering the intetest, they said no. I would like to be able to do something to lower the interest. Right now I make 684.95 every two weeks. What in God's name are you doing buying a $100,000 house when you only make $1,350 a month?!?!? I'm 24 and make over twice that and could never imagine thinking I could afford any kind of house.